I work in Google AdWords a lot. In fact, the majority of my day is spent in AdWords, whether I am managing a client’s account, building new campaigns, doing keyword research, analyzing performance, setting up tests… and I could go on. 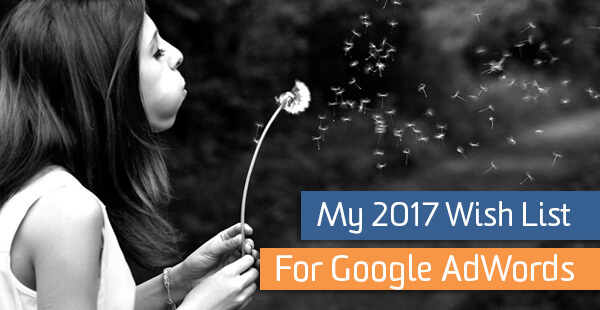 While Google does a great job of supplying us with many useful tools, reports and features, there are certain features that I would love to see available in Google. Hopefully they are listening! Right now, if I need to make adjustments to Google location targeting — both for targeted and negative locations — I need to manually make changes. This is one of the only elements in the entire AdWords interface that is not available for automation using automated rules. I can schedule automated rules for campaigns, ad groups and keywords. I can set rules to activate, de-activate, raise bids, lower bids, raise budgets, lower budgets, etc. The ability to set automated rules for location targeting would be an extremely helpful feature for many of my accounts! Here’s one example of how this could look! Negative keyword lists are really helpful for managing negative keywords across campaigns. Right now, AdWords editor lets you add negative keywords at the campaign and ad group level, but does NOT let you associate negative keyword lists to a campaign. For many of my clients, the majority of negative keywords are found in negative keyword lists. And – if you create a new campaign in AdWords editor – even if you copy and paste from a campaign with a negative keyword list association – it gets removed. That means for every new campaign I create, I need to go into the online AdWords interface and manually attach the negative keyword lists to my campaigns. The ability to add negative keyword lists in the offline tool would be super helpful and time-saving for me. Anywhere on the first search results page. Advertisers that select the first option (top of the SERP) can expect to show up in positions 1, 2 or 3 – i.e. the top of the SERP. What I believe would make this bid strategy more flexible is the ability to bid for first position. With the current bid strategy, I don’t know if my ad is going to show up in position 3 or position 1 when I aim for top of the page. I would love a way to tell Google that I’m going for position 1. Now – for those of you who are advanced with the bidding strategies, you may tell me to use the ‘Bid Adjustment’ functionality to ensure that Google raises my bid high enough. In some cases, this will work. In other cases, which I’ve experienced, that does not accomplish what I’m looking for. For my brand keywords, the estimated top of page bid is low (these are my brand keywords so that’s expected). Google estimates a top of page bid of $0.25. I set my automated bidding strategy for top of page with a 400% bid adjustment on the estimated top of page bid. My bid at auction time becomes $1.00 (remember, this is hypothetical! If there are other bid adjustments, this would change). However, what throws me for a loop at auction time is the appearance of many other competitors bidding on my brand name with high bids in the – let’s say – $40 range. So what happens? I don’t show up in position 1 at times because of my $1 bid compared to the competition’s $40 bid. Yes, relevance is a factor but I can attest to the fact that with extremely low brand bids, sometimes your competitors can outrank you. What have I done when faced with the example above? Typically I change my bid strategy to ensure placement at top of page. But, having the ability to bid to first position would be super helpful in this scenario! Even in other scenarios – being able to bid for that position is another way to try and control where your ad shows up. And what’s more, Google even gives you the estimated first position bid! 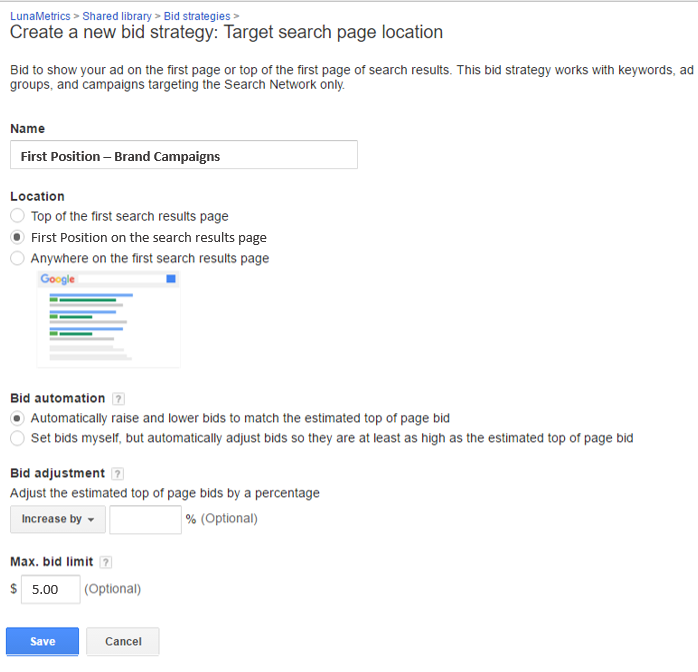 Google provides an estimated first page bid (used for Target Search Page Location bidding strategy), estimated top of page bid (also used for Target Search Page Location bidding strategy) and estimated first position bid! Google – let’s make use of that estimated first position bid and add it as a new automated bidding strategy option! What about you PPC-ers out there? What’s on your wish list?